I really like so much the series which gives the freedom of imagination. The characters are pretty cute and interesting thought 5 volumes, mainly the main minor protagonist is like major, the dialog is simple and not childlike, the color is attractive with simples palettes, the world is great creative and the story is... like Adventure Time. Yes! the British creator, Luke Pearson has make some written and storyboaded episodes of one of these recent well-known Cartoon Network show: Adventure Time between 5th and 7th seasons. P.S. : I did one in one of these best possibly version when the audience works. Since I happily tried one digital pen in the tablet, I will can continue in the next successful era with three different series (original comics, artworks and one franchise's anniversary occassion), instead of traditional. Hilda, Twig, the Midnight giant and the characters of the universe are owned by Nobrow. 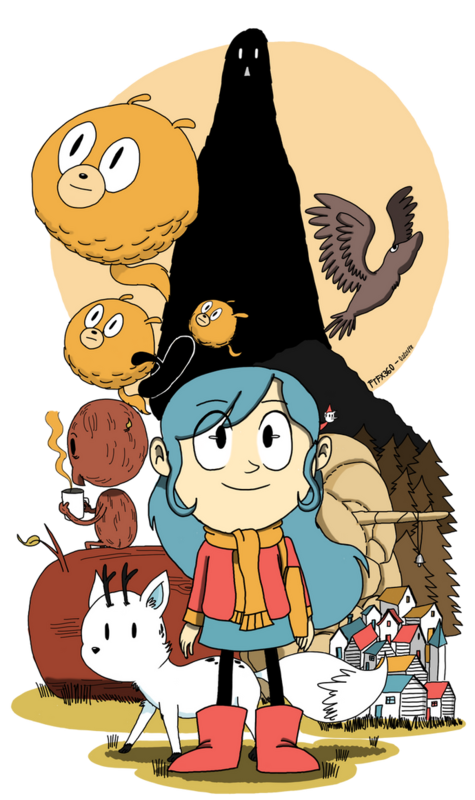 I watched this show and it looks nice, especially the animation and the character Hilda herself. Why are the new shows I watch so amazing? I just finished the first season of the Netflix series and loved it!!!!!!!!!! Me, I've done every episodes in 3 first days after the released date that I should see the adaptation, after the comic. Oh My... you art really improved! I read Hilda and it's more like Adventure Time mixed with Moomin and it's really good! Hey! Next year there's gonna new Moomin series. And I hope that Don Oriolo will announce the big extremely surprised news during Felix The Cat's 100th anniversary in same year. I recommed you should watch Moomin from 1969 and 1972.